The Maritime Administration Department (MARAD) of Guyana saw a reduction of 21.7% in total marine deaths for the year 2015. In the year 2014, the total number of boat accidents totalled eight while in 2015 the number dipped to five. Also for 2015, the number of incidents recorded dropped from 16 to 12 when compared to 2014. The year 2015 recorded no act of piracy when compared to the 2014 which recorded four, according to the report. However, the accidents that occurred were as a result of unlicenced boat and operators. 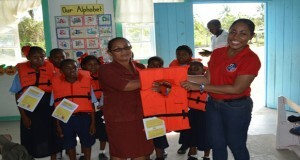 As a result of the accidents, 207 life jackets were distributed to all 10 administrative regions while MARAD helped in promoting safety awareness, particularly in schools. In addition, the United States Coast Guard, in collaboration with MARAD, held a capacity building training for security officers. The report also showed that of the $223.690M budgeted for the department in 2015, the sum of $217.690 was utilised by the end of the year. For 2016, Rogers is hopeful of accomplishing a number of goals in building the capacity of the administration. These include the placement of buoys at the Berbice, Essequibo and Demerara Rivers. Further, all efforts will be made to revive the National Maritime Security Committee. MARAD is working to establish safety centres in various regions around Guyana. Marine Cadets will also receive training on vessels ranging from 50-80 metres in length. They are expected to be qualified mates by the second half of 2016. MARAD’s 2015 report also showed that Guyana signed an agreement with Barbados to provide training of pilots and engineers in 2016.